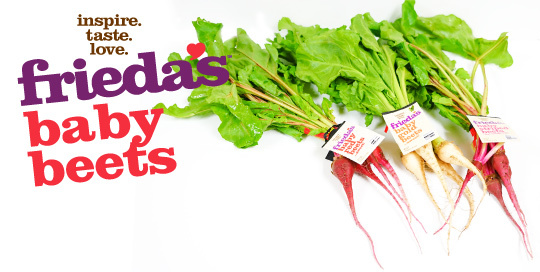 Belonging to the same family as chard, baby beets are harvested young for their edible roots, stems, and leaves, and have a smooth, creamy flavor with a slight earthiness. The beet leaves have a similar taste as Swiss chard. Their small size cuts down cooking time. Scrub the roots and trim the stems to about an inch above the root, then boil for 5 to 15 minutes. Plunge the roots into cold water, slip off the skins, and trim the stems and roots. (Baby beets can also be baked or roasted, which may retain more color.) Slice and serve hot, pickle in vinegar, or use cold in salad. Beets can also be peeled and grated raw for salads. To eat the stems, wash well, then sauté like you would Swiss chard. Rich in antioxidants with detoxifying properties. Choose small to medium-sized beets with firm, smooth skins. Avoid beets that are shriveled, soft, or have rough or flabby skin. Store refrigerated wrapped in a damp towel. Baby beets with tops last 3 days, and baby beets without tops last a couple of weeks.